ST. PAUL, Minn.--(BUSINESS WIRE)--Year after year, “organization” appears on countless New Years resolution lists, particularly at the office and in professional settings, as individuals strive to start the year with increased productivity and workplace efficiency. Today, Post-it Brand from 3M revealed results from a study1 commissioned to gather data surrounding office organization, access to office supplies and how these elements affect office workers in their day to day routines. The survey amplifies the continued need for appropriate office supplies in the workplace and also reveals the importance of organization and how it contributes to overall office morale, attitude and productivity. According to the study, organization and access to the necessary office supplies play an integral role in office life, both for individual workers as well as the office as a whole. Disorganization Conundrum: In today’s offices, disorganization not only looks bad, it can lead to decreased morale and productivity. Three in four office workers believe a disorganized office is indicative of deeper problems at a company. Setting the Example: Executives might want to tidy up their desks as 96 percent of office workers believe that organization is a sign of a better leader. Undersupplied Equals Less Productivity: 94 percent of office workers are less productive when they don’t have all the supplies they need to work. The research also revealed that Post-it Products continue to play an important role in office workers’ daily lives. Despite the rise of the digital office and digital tools, the data showcased that workers continue to embrace analog and rely on paper and Post-it Products to help them stay organized and on task. Paper vs. Computer: 62 percent of office workers prefer to manage their to-do list on a piece of paper rather than through a computer or digital device. An Office Supply Staple: The Post-it Note is a staple of office life; office workers, on average, use 30 Post-it Notes per week, with more than 2 in 5 (43 percent) using 25 or more. Additionally, Post-it Brand continues to support and recognize administrative professionals who go above and beyond through the Post-it Brand Office Excellence Award. Now in its second year, the Office Excellence Award identifies professionals who are committed to keeping their offices running smoothly through organization and adequate office supplies. For additional information on helpful Post-it Products, organization tips and solutions and this year’s Office Excellence Award, visit Post-it.com/officeorg. 1 The 3M Post-it Brand Office Organization survey was conducted by Wakefield Research (www.wakefieldresearch.com) among 1,000 full-time U.S. office workers in 2015, using an email invitation and an online survey. 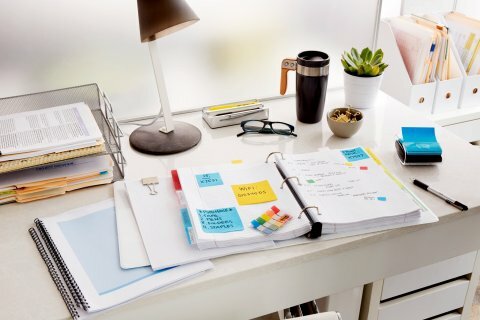 Post-it Brand from 3M revealed results from a study commissioned to gather data surrounding office organization, access to office supplies and how these elements affect office workers.